First aid is an issue businesses can ill afford to ignore, which is why it is essential that first aid facilities are clearly indicated. We have a wide range of first aid signs designed to give clear visual guidance to your first aid room, equipment and trained first aiders. Have a look for yourself and take a step closer to a safer workplace. For more information, see below for our FAQs and buying guide. The above range of first aid signage is fully compliant with BS EN ISO 7010, and is designed to be easily understood by employees, visitors and members of the public. A well-positioned first aid sign has the potential to save lives by clearly indicating where vital medical equipment can be found or medical attention sought. Employers are required by law to provide adequate and appropriate equipment facilities and personnel to ensure that workers receive immediate attention if they have an accident or are taken ill at work, and first aid signs are an important part of this provision. First aid signs can be used to detail who to turn to in the event of a medical incident or an accident, to signpost first aid facilities and equipment for ease of access or to help ensure that provisions are adequate by providing a space for inspection and usage notes to be made. These signs help to inform employees and visitors of first aid provisions within premises. They can be used to provide all types of useful information, for example we provide signs that highlight the details of qualified first aiders and first aid equipment operators on the premises. Workplaces also use first aid signs to direct people to equipment that can be used in the event of an accident or medical emergency - helping people to locate everything from first aid kits to an eyewash station, burns kit, decontamination shower or even a workplace defibrillator. First aid signage is also a useful tool in tracking use of these provisions, with dry-wipe first aid signs available for the purposes of recording equipment use and kit inspections. Many employers will be required by law to provide adequate first aid signage within their premises, other property owners may wish to install first aid signs to offer peace of mind to those on the premises at any given time. Use our large selection of sign fixings to be sure that the signs you use remain adhered to any surface for a long period of time. First aid signs should be used in locations where they can best provide information to people in the area. They should be placed in easily visible positions and property or business owners will want to consider the type of sign that offers maximum visibility in that area; for example, 3D first aid signs may provide better visibility in some areas, while wall-mounted signs can be helpful in others. We even offer anti-slip floor markers which can help to ensure that first aid areas are clearly demarcated and easily identified. Our range of first aid signs is comprehensive and includes all types of signage needed to clearly signpost and keep track of first aid practices within any premises. 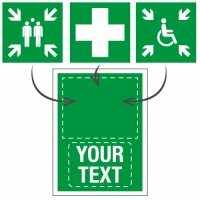 We have location marking and directional signs for everything from workplace first aid kits and stretchers to defibrillator signs, helping to ensure these essential safety items are easily located in the event they are needed. We have a selection of signage that helps designate areas for first aid and safety practices such as emergency facilities signs and drinking water signs. Our range of first aid signs also includes a selection of informational signage such as first aider signs that can help workers and visitors quickly identify those best trained to help them in the event of illness or emergency. Our range of reusable record signs can help to keep track of first aid provisions – dry wipe first aid signage can be used to record details of first aid equipment inspections, while our first aid kit and burns kit, contents-used signs help to ensure these vital health and safety supplies remain stocked at the appropriate levels. How do I know which first aid signs I need? First aid signage must be adequate and appropriate to your place of business. If you are in any doubt about the kind of signage that you require, we would recommend you contact the Health and Safety Executive for clarification. Once you understand what is required, we will be able to provide you with all the necessary first aid signage. 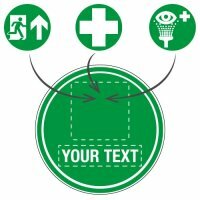 Where should I place First Aid Signs? The positioning of first aid signage will depend on the layout and use of your premises. Placing directional and location signage on both walls and floors can help to ensure that people are able to locate first aid in the workplace. Informational signage should always be placed at a height that is easily readable for members of the workforce and visiting public.